Halalan 2016 update: Presidential candidate LP standard bearer Mar Roxas has conceded to Davao City Mayor Rodrigo Duterte on Tuesday. In a press conference held at the Liberal Party headquarters in Cubao, Quezon City, three hours after the 10 a.m. schedule, the former DILG secretary thanked his family members and supporters. Roxas wished Duterte success and said it is time to heal the country. "Your victory is the victory of the nation," he said. 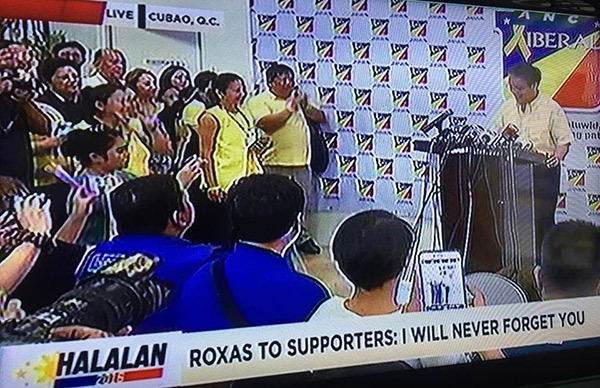 At one point, Roxas was teary-eyed and became emotional as his supporters chanted his name. "It's not about me, it's not about anyone, it's about our country," he added. Roxas urged supporters to continue monitoring the counting of votes and supporting his running mate, vice presidential candidate Leni Robredo, who is currently ahead of her rival, Senator Bongbong Marcos, by a slim margin.